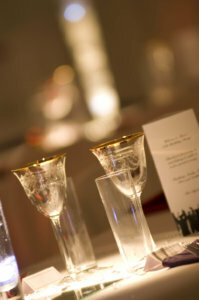 Beverage and Bar Service Tips for Wedding!! When it involves wedding catering, a significant thought is what beverages to serve. Unless everybody you know is non-drinkers, several of your guests can expect you to have a bar setup that serves alcoholic beverages of some types. However what you serve and the way you’ll serve it depends on your understanding of wedding reception bar etiquette. Some of these factors comprise the time of day, number of guests, rules & regulations by venue site and, of course, your own preferences. 1. Beverages Stations: Growing in popularity, these are quite similar to food stations. Each features a specific beverage theme — a cocktail bar, tropical drinks like margaritas and pina coladas, and a sparkling wine-tasting bar. 2. Champagne Reception: This kind of reception highlights champagne as the solely alcohol-based drink served. The term “champagne” refers to sparkling wine made in France’s Champagne region. catering service, enable four glasses per standard bottle. For a toast, figure one glass per person. For cocktails, you may need two. One-half bottle per guest is typically enough for most receptions unless you expect a series of formal toasts. 3. Corkage Charge: This can be a fee per bottle to open and serve liquor you bring round your reception website. Most of the time restaurants can charge corking fees. Otherwise, venues would require you to use their wine. 4. 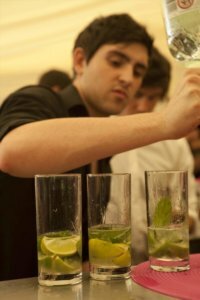 Consumption Bar: At this kind of reception, your wedding catering bartenders keep a running tab of drinks served and total the cost per drink. You pay for every drink consumed, and, depending on the tastes of your guests, your cost may well be high. 5. Mixed Drinks: Everything from a cosmopolitan to a Bahama mama, mixed drinks are made of combinations of liquor, juices, and waters. They include such drinks as martinis and Manhattans. They cost relatively high per drink than most wine or champagnes. 6. Open Bar: Here your guests can have whatever drinks, and as many as they want, comparatively speaking. You pay a flat rate per person for a certain period of time. 7. Poured Drinks: Simple drinks that aren’t mixed, shaken or stirred. For instance, vodka on the rocks would be a poured drink. 8. Premium Brands: Well-known or top-grade brands of liquors, foreign or vintage label beers and wines. These are among most expensive options available. 9. 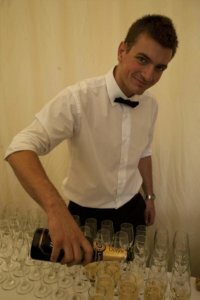 Table Service: Wedding catering drink service provided at the table by a waiter or by a server with a rolling bar. 10. Wine & Champagne Bar: This option features champagne and alternative wines that may vary from Chardonnays and Bordeaux to Chianti and Zinfandels. They’re typically accompanied by an option of sparkling waters and juices to satisfy those guests who prefer non-alcoholic drinks. By following bar etiquette and understanding the nomenclature and your choices, you’ll be able to set off most wedding issues before the reception even starts. It conjointly prevents wedding guests from expecting something they’ll not be ready to have.